A-Frames are an ideal way to promote businesses. It is important that any marketing campaigns and messages are transmitted to the target audience as quickly as possible. Reaching out and engaging passers-by through the use of the poster campaigns placed within the A-Frame will drive traffic directly to your business. Just think of the A-Frame as your “pavement sales person” attracting people at the point the sign is situated, enticing them to go into your business to browse or find out more about an offer or product. The sign can be placed outside at the start of business hours, and brought back in at close of business. No salary to be paid. No sickness or holidays to cover. Just a reliable source of sales and advertising outside your shop front that could be used 24/7; 365 days of the year. When you look at it from that perspective, the A-Frame really is an ideal purchase and at an affordable price. Ideal for businesses, retail sector, public sector, events, exhibitions, self-employed mobile businesses and more. 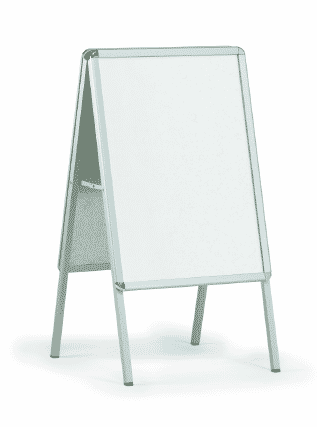 No need to buy new signs for different marketing campaigns – just change your posters!